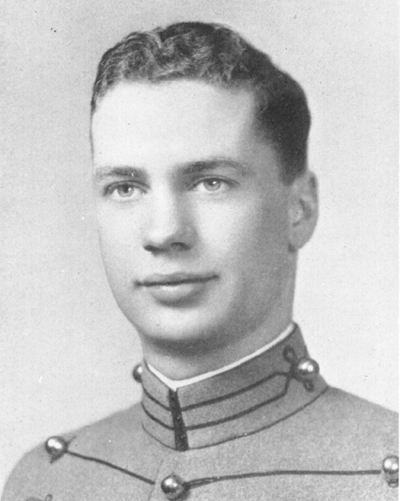 Born on March 22, 1922, he graduated from the United States Military Academy at West Point in 1945. He served at the end of World War II, in the Korean Conflict and in the Vietnam War. He was killed-in-action in the Republic of Vietnam on July 7, 1970 while commanding the 1st Cavalry (Airmobile). His command helicopter crashed while in a hostile combat zone. He had previously served in the Korean War. He was subsequently buried in Section 5 of Arlington National Cemetery. Status: Killed In Action from an incident on 07/07/1970 while performing the duty of Pilot. The 1st Cavalry Division suffered a tragic loss early in July when the 1st Cavalry Division Command Helicopter, piloted by Major General George William Casey, enroute to visit wounded Skytroopers, crashed in a remote area in South Vietnam. Major John Alexander Hottell III, Aide-de-Camp; First Lieutenant William Frederick Michel, Pilot; Command Sergeant Major Kenneth William Cooper, Division Sergeant Major; Sergeant William Lee Christenson, Door Gunner; Sergeant Ronald Francis Fuller, Crew Chief; Sergeant Vernon Kenneth Smolik, Aide & Stenographer. 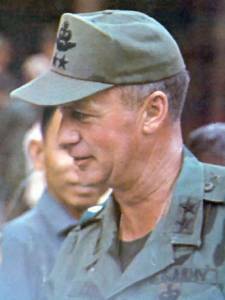 General Casey took command of the 1st Cavalry Division, considered the Army's best, in May, while the division was engaged in the operation against the communist sanctuaries in Cambodia. He served as the Task Force Commander in that operation. The Division, the Association, the Army, and the Nation, lost a dedicated and gallant leader. 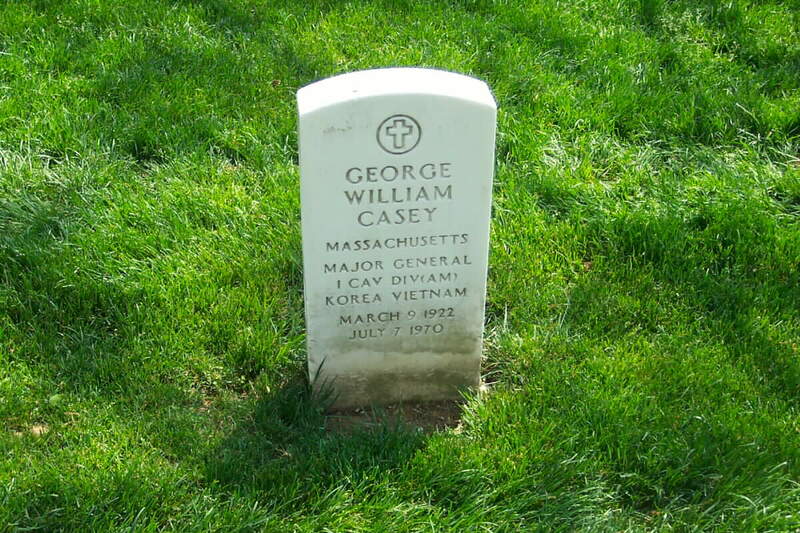 As one of the youngest Major Generals in the United States Army, General Casey was an outstanding soldier with a bright future. In the names of the men, the Association extends deepest sympathy. SAIGON, South Vietnam, July 11, 1970 – The United States Command said today that seven bodies had been recovered from the wreckage of a helicopter that had carried Major General George William Casey, the commander of the First Cavalry Division (Airmobile). A military spokesman declined to positively identify the bodies, believed to be those of General Casey as well as six aides and crewmen. General Casey was widely regarded as one of the most promising officers in the Army before his death at the age of 48. His combination of traditional Army methods with the latest in air mobility tactics was widely respected by other commanders who had asked to serve under him, and by his superiors. He was a familiar figure to troops in the First Cavalry Division in South Vietnam. He had served as Chief of Staff of the division there in 1967 and has for nine months assistant division commander before he gained his second stat and a promotion to commander two months ago. General Casey, who earned a master’s degree in international relations at Georgetown University in 1958 and a master’s degree in business administration at George Washington University in 1963 was selected by the Army in 1965 to spend a year of study at the Center for International Affairs of Harvard University, where had had studied earlier before going to West Point. General Casey’s initial service in the Army was as a platoon leader of a paratroop regiment stationed in Japan. He moved through his division and became aide-de-camp of then Major General Lyman L. Lemnitzer. In 1951, he became a rifle company commander in Korea and participated in engagements at Heartbreak Ridge. After Korean service, he returned to the United States for a number of tours of duty before going to Europe in 1963 as commander of the Eighth Infantry Division. General Casey is survived by his wife, Mrs. Elaine Morton Casey of North Scituate, Massachusetts, three daughters and two sons.